I recently switched theme in oh-my-zsh to powerlevel9k while the docs cover most things the wifi signal example was Linux only so I modified it to work on MacOS (only tested on Sierra) and modified to use nerd-fonts as its not the same unicode as in the docs example. Recently I found a nice use for Proxies when writing tests however the nodeunit runner doesn’t support the –harmony-proxies parameter a small runner was created to allow us to run tests with working Proxy support. Just create a small script that looks something like this. A while back i got a Yubikey Neo and a Neo-n they are cool little devices that can work as the second part of a 2 factor authentication. The Neo apart from usb also supports Nfc so it can be used with most modern Android phones. So here’s a short summary of how to get it all working. To get everything to work you need to install the KeeChallenge plugin in KeePass, I used the latest version (2.29) when setting everything up. The trick is to put the password file on something shared that everything can read usb stick, Dropbox or similar. For windows follow this guide. Don’t forget to copy the files from the YubiKey-Personalization release. On OSX the use following guide. A bit more hands on work but just follow the steps. Currently it seems like mono 4.0.2 doesn’t work so go with 4.0.1. On android you need the Keepass2Android Password Safe and YubiChallenge and a phone that supports Nfc, most modern Android phones do. 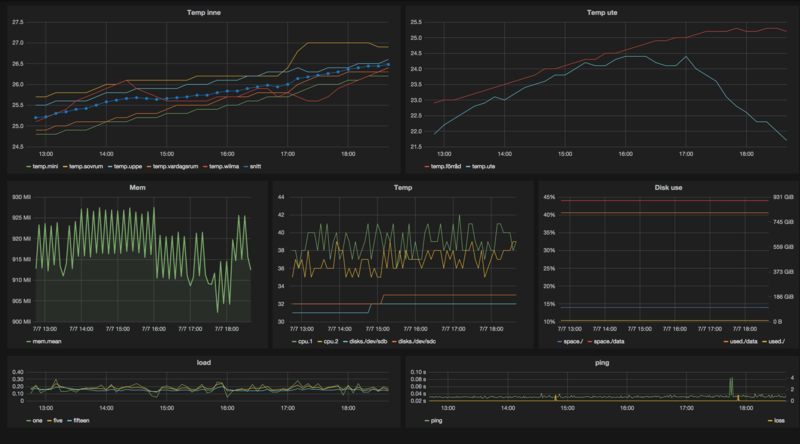 So I built one using InfluxDB, Grafana, Nginx, Tellstick Net and a bunch of scripts. Here’s a breakdown of the parts and what feeds them. At home i have a Tellstick Net and a bunch of remotecontrolled power switches connected to this i also have a bunch of temperature sensors (this model) places around the house, outside and in my shed. Data is fed into InfluxDB using a couple of different scripts. To log status for my home server running ubuntu I modified my status script, this is logged every 5 minutes. I plan to add more fun sensors that work with Tellstick, things like rain and wind sensors. Something that logs how bright the sun is would be cool to. At some point when I have more info it will be fun to do some ‘big data’ stuff using the data set I have, right now it’s been running for about 6 months so next year it’s possible to graph current vs last year for many values.